The King was aided by Scottish allies and was attempting to regain the throne that had been lost when his father Charles I was executed. 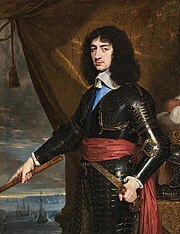 The commander of the Scots, David Leslie, supported the plan of fighting in Scotland, where royal support was strongest. Charles, however, insisted on making war in England. He calculated that Cromwell's campaign north of the River Forth would allow the main Scottish Royalist army which was south of the Forth to steal the march on the Roundhead New Model Army in a race to London. He hoped to rally not merely the old faithful Royalists, but also the overwhelming numerical strength of the English Presbyterians to his standard. He calculated that his alliance with the Scottish Presbyterian Covenanters and his signing of the Solemn League and Covenant would encourage English Presbyterians to support him against the English Independent faction which had grown in power over the last few years. The Royalist army was kept well in hand, no excesses were allowed, and in a week the Royalists covered 150 miles in marked contrast to the Duke of Hamilton's ill-fated expedition of 1648. On 8 August the troops were given a well-earned rest between Penrith and Kendal. But the Royalists were mistaken in supposing that the enemy was unaware. Everything had been foreseen both by Cromwell and by the Council of State in Westminster. The latter had called out the greater part of the militia on 7 August. Lieutenant-General Charles Fleetwood began to draw together the midland contingents at Banbury. The London trained-bands turned out for field service no fewer than 14,000 strong. Every suspected Royalist was closely watched, and the magazines of arms in the country-houses of the gentry were for the most part removed into the strong places. On his part Cromwell had quietly made his preparations. Perth passed into his hands on 2 August and he brought back his army to Leith by 5 August. Thence he dispatched Lieutenant-General John Lambert with a cavalry corps to harass the invaders. Major-General Thomas Harrison was already at Newcastle picking the best of the county mounted-troops to add to his own regulars. On 9 August, Charles was at Kendal, Lambert hovering in his rear, and Harrison marching swiftly to bar his way at the Mersey. Thomas Fairfax emerged for a moment from his retirement to organize the Yorkshire levies, and the best of these as well as of the Lancashire, Cheshire and Staffordshire militias were directed upon Warrington, which Harrison reached on 15 August, a few hours in front of Charles's advanced guard. Lambert too, slipping round the left flank of the enemy, joined Harrison, and the English fell back (16 August), slowly and without letting themselves be drawn into a fight, along the London road. Cromwell meanwhile, leaving George Monck with the least efficient regiments to carry on the war in Scotland, had reached the river Tyne in seven days, and thence, marching 20 miles a day in extreme heat with the country people carrying their arms and equipment, the regulars entered Ferrybridge on 19 August, at which date Lambert, Harrison and the north-western militia were about Congleton. It seemed probable that a great battle would take place between Lichfield and Coventry on or just after 25 August and that Cromwell, Harrison, Lambert and Fleetwood would all take part in it. But the scene and the date of the denouement were changed by the enemy's movements. Shortly after leaving Warrington the young king had resolved to abandon the direct march on London and to make for the Severn valley, where his father had found the most constant and the most numerous adherents in the first war, and which had been the centre of gravity of the English Royalist movement of 1648. Sir Edward Massey, formerly the Parliamentary governor of Gloucester, was now with Charles, and it was hoped that he would induce his fellow Presbyterians to take arms. The military quality of the Welsh border Royalists was well proved, that of the Gloucestershire Presbyterians not less so, and, in basing himself on Gloucester and Worcester as his father had done on Oxford, Charles II hoped, naturally, to deal with the Independent faction minority of the English people more effectually than Charles I had earlier dealt with the majority of the people of England who had supported the Parliamentary cause. But even the pure Royalism which now ruled in the invading army could not alter the fact that it was a foreign, Scottish, army, and it was not merely an Independent faction but all England that united against it. Charles arrived at Worcester on 22 August and spent five days in resting the troops, preparing for further operations, and gathering and arming the few recruits who came in. The delay was to prove fatal; it was a necessity of the case foreseen and accepted when the march to Worcester had been decided upon, and had the other course, that of marching on London via Lichfield, been taken the battle would have been fought three days earlier with the same result. Worcester itself had no particular claim to being loyal to the King. Throughout the First Civil War it had taken the pragmatic position of declaring loyalty to whichever side had been in occupation. The epithet 'Faithful City' arose out of a cynical (and unsuccessful) claim at the Restoration for compensation from the new king. Cromwell, the lord general, had during his march south thrown out successively two flying columns under Colonel Robert Lilburne to deal with the Lancashire Royalists under the Earl of Derby. Lilburne entirely routed a Lancashire detachment of the enemy on their way to join the main Royalist army at the Battle of Wigan Lane on 25 August and as affairs turned out Cromwell merely shifted the area of his concentration two marches to the south-west, to Evesham. Early on 28 August, Lambert's brigade made a surprise crossing of the Severn at Upton, 6 miles below Worcester. In the action which followed Massey was severely wounded and he and his men were forced to retreat northwards along the west bank of the Severn towards the river Teme and Worcester. Fleetwood followed Lambert with reinforcements and orders to advance north towards the Teme. This western envelopment severed the Royalists lines of communications to Wales and the western counties of England. The Royalists were now only 16,000 strong with no hope of significant reinforcements and disheartened by the apathy with which they had been received in districts formerly all their own. Cromwell, for the only time in his military career, had a two-to-one numerical superiority. On 30 August Cromwell delayed the start of the battle to give time for two pontoon bridges to be constructed, one over the Severn and the other over the Teme, close to their confluence. The delay allowed Cromwell to launch his attack on 3 September, one year to the day since his victory at the Battle of Dunbar. Cromwell took his measures deliberately. Lilburne from Lancashire and Major Mercer with the Worcestershire horse were to secure Bewdley Bridge, 20 miles (32 km) north of Worcester and on the enemy's line of retreat. Fleetwood was to force his way across the Teme and attack St John's, the western suburb of Worcester. While Lambert commanded the eastern flank of the army which would advance and encircle the eastern walls of Worcester, Cromwell would lead the attack on the southern ramparts of the city. The assault started on the morning of 3 September and initially the initiative lay with the Parliamentarians. Fleetwood forced the passage of the Teme over the pontoon bridges against Royalists under the command of Major General Montgomery. Colonel Richard Deane's initial attempts to cross the Powick Bridge (where Prince Rupert of the Rhine had won the Battle of Powick Bridge, his first victory, in 1642) failed against stubborn resistance by the Royalists (many of whom were Scottish Highlanders) commanded by Colonel Keith. By force of arms and numbers, the Royalist army was pushed backward by the New Model Army with Cromwell on the eastern bank of the Severn and Fleetwood on the western sweeping in a semicircle four miles (6 km) long up toward Worcester. The Royalists contested every hedgerow around Powick meadows. This stubborn resistance on the west bank of the Severn north of the Teme was becoming a serious problem for the Parliamentarians, so Cromwell led Parliamentary reinforcements from the eastern side of the town over the Severn pontoon bridge to aid Fleetwood. Charles II, from his vantage point on top of Worcester cathedral's tower, realised that an opportunity existed to attack the now-exposed eastern flank of the Parliamentary army. As the defenders on the Western side of the city retreated in good order into the city (although during this manoeuvre Keith was captured and Montgomery was badly wounded), Charles ordered two sorties to attack the Parliamentary forces east of the city. The north-eastern sortie through St. Martin's Gate was commanded by the Duke of Hamilton and attacked the Parliamentary lines at Perry Wood. The south-eastern one through Sidbury Gate was led by Charles II and attacked Red Hill. The Royalist cavalry under the command of David Leslie that was gathered on Pitchcroft meadow on the northern side of the city did not receive orders to aid the sorties and Leslie chose not to do so under his own initiative. Cromwell seeing the difficulty that his east flank was under rushed back over the Severn pontoon bridge with three brigades of troops to reinforce the flank. Although they were pushed back, the Parliamentarians under Lambert were too numerous and experienced to be defeated by such a move. For an hour, the Parliamentarians retreated before the unexpected attack. However, following their reinforcement by Cromwell's three brigades, they reversed the situation and drove the Royalists back toward the city. The Royalist retreat turned into a rout in which Parliamentarian and Royalist forces intermingled and skirmished up to and into the city. The Royalist position became untenable when the Essex militia stormed and captured Fort Royal, (a redoubt on a small hill to the south-east of Worcester overlooking the Sidbury gate), turning the Royalist guns to fire on Worcester. Once in the city, Charles II removed his armour and found a fresh mount; he attempted to rally his troops but it was to no avail. A desperate Royalist cavalry charge down Sidbury Street and High Street, led by the Earl of Cleveland and Major Careless amongst others, allowed King Charles to escape the city by St. Martin's Gate. This cavalry force was composed of the few Midland English Royalists who had rallied to Charles II, and largely consisted of Lord Talbot's troop of horse. The defences of the city were stormed from three different directions as darkness came on, regulars and militia fighting with equal gallantry. Most of the few thousands of the Royalists who escaped during the night were easily captured by Lilburne and Mercer, or by the militia which watched every road in Yorkshire and Lancashire. Even the country people brought in scores of prisoners, for the Royalist officers and men alike, stunned by the suddenness of the disaster, offered no resistance. About 3,000 men were killed during the battle and a further 10,000 were taken prisoner at Worcester or soon afterwards. The Earl of Derby was executed, while the other English prisoners were conscripted into the New Model Army and sent to Ireland. Around 8,000 Scottish prisoners were deported to New England, Bermuda, and the West Indies to work for landowners as indentured labourers. Parliamentary casualties numbered in the low hundreds. Plaque on at the Sidbury Gate, Worcester, U.K., inscribed with part of Cromwell's post-victory despatch: "IT IS FOR AUGHT I KNOW A CROWNING MERCY". Charles II's escape included various incidents, including one of his hiding from a Parliamentarian patrol in an oak tree in the grounds of Boscobel House. The result of the battle was, in brief, one of those rare victories in which a pursuit is superfluous. In announcing the Worcester victory of the day earlier, Cromwell's 4 September 1651 despatch to William Lenthall, the Speaker of the House of Commons, has become famous: "The dimensions of this mercy are above my thoughts. It is, for aught I know, a crowning mercy". Hence, Cromwell thought the victory was the greatest of all the favours, or mercies, given to him by God, and the expression "crowning mercy" is frequently linked to the battle, thought to be descriptive of the impact of the end of the English Civil War through complete destruction of the last Royalist army. The Parliamentary militia were sent home within a week. Cromwell, who had ridiculed "such stuff" six months ago, knew them better now. "Your new raised forces", he wrote to the Rump Parliament, "did perform singular good service, for which they deserve a very high estimation and acknowledgement". The New England preacher Hugh Peters gave the militia a rousing farewell sermon "when their wives and children should ask them where they had been and what news, they should say they had been at Worcester, where England's sorrows began, and where they were happily ended", referring to the first clash of the Royalist and Parliamentarian Armies at the Battle of Powick Bridge on 23 September 1642, almost exactly nine years before. Cromwell's plan of battle divided his army into three parts, each part having a specific target: Colonel Robert Lilburne from Lancashire and Major Mercer with the Worcestershire horse were to secure Bewdley Bridge on the enemy's line of retreat. Lambert and Fleetwood were to force their way across the Teme and attack St John's, the western suburb of Worcester. Cromwell himself and the main army were to attack the town itself. This plan was executed, and in the opinion of C.F. Atkinson the author of the Encyclopædia Britannica Eleventh Edition article on the Civil War, the Battle of Worcester was indeed—as a German critic, Fritz Hoenig, pointed out—the prototype of the Battle of Sedan. [a] Worcester resembled Sedan in much more than outward form. Both were fought by "nations in arms", by citizen soldiers who had their hearts in the struggle, and could be trusted not only to fight their hardest but to march their best. Only with such troops would a general dare to place a deep river between the two halves of his army or to send away detachments beforehand to reap the fruits of victory, in certain anticipation of winning the victory with the remainder. The result was, in brief, one of those rare victories in which a pursuit is superfluous. The people in the neighborhood appeared so ignorant and careless at Worcester that I was provoked and asked "And do Englishmen so soon forget the ground where liberty was fought for? Tell your neighbors and your children that this is holy ground, much holier than that on which your churches stand. All England should come in pilgrimage to this hill, once a year". ^ a b Cone 2003. ^ a b c d e Atkinson 1911, p. 420. ^ Atkin, Malcolm (2004). Worcestershire Under Arms: an English county during the Civil Wars. Barnsley: Pen and Sword. ISBN 1-84415-072-0. ^ Willis-Bund 1905, pp. 233, 234. ^ Royle 2006, p. 600. ^ a b c d e f Atkinson 1911, p. 421. ^ Willis-Bund 1905, p. 240. ^ BBC staff 2003, dawn attack. ^ BBC staff 2003, Cromwell intervenes. ^ a b BBC staff 2003, Charles intervenes. ^ Willis-Bund 1905, p. 245. ^ a b BBC staff 2003, Cromwell intervenes (2). ^ Grammont 1846, p. 490. ^ Atkin (2004), pp. 141–145. ^ a b S.A. Bent, 1887, "Familiar Short Sayings of Great Men: Oliver Cromwell", at Bartleby.com (online), see "Archived copy". Archived from the original on 27 April 2015. Retrieved 2015-04-21. CS1 maint: Archived copy as title (link), accessed 20 April 2015. ^ Fuller, Isaac. "Set – Charles II's escape after the Battle of Worcester". National Portrait Gallery. Retrieved 1 September 2015. ^ Hanbury 1844, pp. 409,410 (footnote). ^ Foster 1840, p. 304. ^ Atkin 1998, p. 120. ^ Adams & Adams 1851, p. 394. Adams, John; Adams, Charles Francis (1851). The Works of John Adams, Second President of the United States: Autobiography, continued. Diary. Essays and controversial papers of the Revolution. The Works of John Adams, Second President of the United States. 3. Little, Brown. p. 394. Atkin, Malcolm (1998). Cromwell's Crowning Mercy The battle of Worcester 1651. Sutton Publishing 1998. p. 120. Atkin, Malcolm (2004) Worcestershire Under Arms: An English County During the Civil Wars. Pen and Sword Books, Barnsley. BBC staff (9 June 2008). "Prince will finally pay off debt". BBC News Online. Retrieved 29 October 2010. BBC staff (December 2003). "Battle of Worcester – timeline". BBC website. Cone, Wm. (2003). "Scottish Regiments at the Battle of Worcester". Electric Scotland. Retrieved 29 July 2015. Fortescue, John William (1899). A history of the British Army. 1. London: Macmillan. p. 247. Foster, John (1840). The statesmen of the commonwealth of England: with a treatise on the popular progress in English history. 4. Longman, Orme, Brown, Green & Longmans. p. 304. Hanbury, Benjamin (1844). Historical memorials relating to the Independents or Congregationalists. 3. Congregational Union of England and Wales. p. 409,410 (footnote). Hoenig, Fritz August (1889). Oliver Cromwell. 3. Leipzig: K. R. Vogelsberg. p. [page needed]. OCLC 679863787. Grammont, Count (1846). Sir Walter Scott (ed.). Memoirs of the Court of Charles the Second and the Boscobel Narratives. Henry G Bohn. Royle, Trevor (2006) . Civil War: The Wars of the Three Kingdoms 1638–1660. Abacus. ISBN 978-0-349-11564-1. Willis-Bund, John William (1905). The Civil War in Worcestershire 1642–1646 and the Scotch invasion of 1651. Simpkin, Marshall, Hamilton, Kent and Company. pp. 233–234. This article incorporates text from a publication now in the public domain: Atkinson, Charles Francis (1911). "Great Rebellion" . In Chisholm, Hugh (ed.). Encyclopædia Britannica. 12 (11th ed.). Cambridge University Press. pp. 420–421. See section 57, The Third Scottish Invasion of England. Cary, Henry, ed. (1842). "Battle of Worcester". Great Britain History Civil War, 1642–1649 Sources. pp. 353–360. . Edited copies of primary sources from the Bodleian Library. Stace, Machell, ed. (1810). Cromwelliana. A chronological detail of events in which Oliver Cromwell was engaged; from the year 1642 to his death 1658: with a continuation of other transactions, to the restoration. Printed by George Smeeton for Machell Stace. pp. 112–116. Edited copies of primary sources. "BBC - Hereford and Worcester Features - Battle of Worcester pictures". www.bbc.co.uk. Retrieved 2 September 2017. Historic Environment and Archaeology Service (25 December 2012). "The Battle of Worcester". Worcestershire County Council. Archived from the original on 25 December 2012. Plant, David (20 August 2008). "The Battle of Worcester, 1651". BCW Project. Retrieved 2 September 2017. Kelsall, Andrew (7 May 2006). "Fort Royal Hill, where liberty was fought for (modern picture of the earth works)". flickr.com. "Map of the Battle of Worcester 1651". maps.google.co.uk. Retrieved 2 September 2017.